We moved into our house in April and the stuff we do not use on a daily basis I put in our awesome walk in attic space. I was trying to find something in the attic last week and I found our big Belgian waffle maker in the process, and I knew I needed to make some waffles. We are really not big breakfast eaters. I normally have some fresh juice or some greek yogurt and Cody skips breakfast all together, so our waffle iron goes unused for months at a time. While I was planning my weekly menu I remembered my waffle maker and decided I need to make a delicious savory waffle. I have heard of Chicken and Waffles before, but I have never eaten it, so I thought I would make something like that. Cody likes the dark meat of the chicken so I bought some boneless/skinless thighs and he was pretty impressed. This recipe is really easy, even though it has a few steps to it. You can always take a short cut and use a waffle mix and just add the seasonings in the recipe. Preheat your waffle Iron. Sift the flour, salt and baking powder together in a large mixing bowl. In a smaller bowl whisk the egg yolks with the italian seasoning, pepper and garlic powder, add the melted butter and milk and whisk to combine, add the cheese and stir. Mix the egg mixture with the flour mixture and stir to combine. With an electric mixture beat the egg whites until soft peaks form, gently fold the egg whites into the batter and stir gently. Spray your waffle iron well and pour batter into iron and cook according to your waffle irons instructions. Cover the bottom of a skillet with olive oil and heat it over med-med high heat. Sprinkle the chicken with salt and pepper on both sides. Once the oil is hot put the chicken in the pan and cook only turning once. The outside will get a nice golden brown color. In the same pan the chicken was cooked in with the same oil whisk in the flour over medium heat and create a roux. If it is all crumbly add a bit more oil, stir until it starts to smell like pancakes and is getting a bit bubbly. Maybe 3-4 min. Whisk in the milk and keep whisking. Turn the heat to medium low and add the salt and pepper. Keep stirring until desired thickness is reached, the longer it cooks the thicker it gets. If it is not thickening you can whisk in some more flour a little at a time. 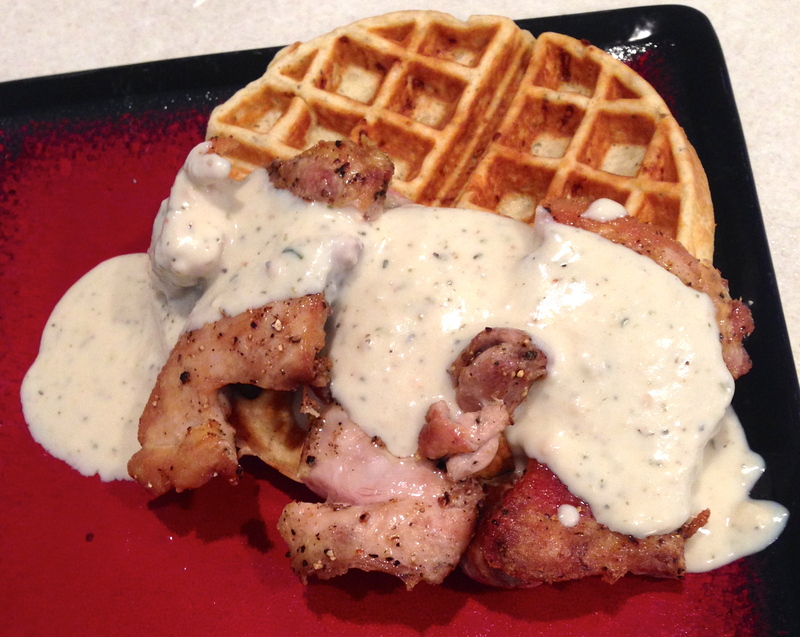 Top the Waffles with the Chicken and pour gravy on top. Serve with some green beans and fresh fruit salad. Enjoy!